Cathryn Sill received the AAUW Award for Juvenile Literature at the North Carolina Literary and Historical Association 108th Meeting held on Saturday, November 8, in Raleigh. Mrs. Sill received the award for her latest book called About Habitats: Wetlands. This is a basic text aimed at grades PreK-3. 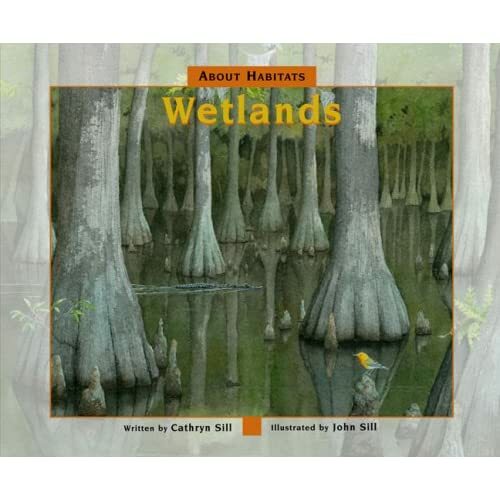 Each page details a characteristic of a type of wetland in simple and succinct language. Sentences are short and simple for young readers to understand. As children look at the colorful illustrations, they will gain additional knowledge of the habitats by learning words that depict different environments. An appreciation of our environment through Sill’s book at such a young age, is very important as we seek to protect our world from the ravishes of pollution and other environmental hazards. Besides the succinct text and the beautifully detailed illustrations, there is an afterword which contains a description of the various habitats. Sill is a former elementary school teacher and the author of the About… series. With her husband John and brother-in-law Ben Sill, she coauthored the popular bird-guide parodies, A Field Guide to Little-Known and Seldom-Seen Birds of North America and Beyond Birdwatching. Husband John is a noted wildlife illustrator for all the About books. Other Sill books for young children include About Marsupials, About Birds, About Mammals, and About Insects. The American Association of University Women Award for Juvenile Literature is presented by AAUW of North Carolina and administered by the North Carolina Literary and Historical Association.